Excited to be reading from Moon Juice at this brand new festival of poetry and spoken word in Birmingham. Free tickets to the reading are available here (click through to Saturday's line-up) – and there are all sorts of brilliant events happening across the weekend. A special Imagine Children’s Festival poetry reading for 8 to 11-year-olds and their grown-ups. Featuring Liz Brownlee, John Lyons and Kate Wakeling. Aurora Orchestra’s much-loved family concerts continue with a magical journey through a wintery world in the company of Jimbo the snow elephant. Help Jimbo shuffle like a penguin, hop like a toad and sparkle like a thousand fireflies as he realises his dream to become a dancer. Blending beautiful chamber arrangements of Debussy’s piano music with a specially-commissioned story from writer Kate Wakeling, this immersive musical adventure is presented by dancer Mia Theil Have in a 30-minute performance for children aged 0-4 years. The Oxford launch of The Rainbow Faults, also featuring readings from Shara Lessley and Erica McAlpine. Drawing the first year of Mozart’s Piano to a close, Aurora presents a concert celebrating the exuberance and imagination of Mozart’s childhood. Set within Wolfgang and sister Nanette’s make-believe world, the Kingdom of Back (or rather, the Kcab fo Modgnik), this programme brings together Mozart’s piano concerto No. 7, Ravel’s Mother Goose Suite, and Saint-Saëns’ The Carnival of the Animals. Aurora welcomes two recent winners of the BBC Young Musician of the Year Competition – Lara Melda and Martin James Bartlett – as soloists, while stories from Writer-in-Residence Kate Wakeling weave together glimpses of Mozart’s early family life with fresh imaginings of the mischievous creatures and fantastical lands so beautifully evoked by Saint-Saëns and Ravel. A mischievous musical adventure exploring loss, change and friendship, featuring music by Bach, Couperin, Berio, Moondog, Meredith Monk and TROUPE. The Oxford Lieder Festival has commissioned a cycle of children's songs from leading composer Cheryl Frances-Hoad, setting poems from Moon Juice, to be performed by Sophie Daneman, Mark Stone and Sholto Kynoch at this year's festival. The concert will also feature songs from Schumann's Album for the Young. Welcome to the Curious Laboratory of Song: a place where tunes are brewed and poems fizz, where unlikely concoctions of sounds and words summon giants and ghostly towns (as well as a prize-winning nose-picker). Make a musical rainstorm, race time itself and coax the jolliest of boatmen back to shore in this interactive storytelling concert, including music by Schubert, Poulenc, Wolf (he doesn't bite) and Copland.​With Katie Bray (Mezzo-soprano), Daniel Norman (Tenor), William Vann (Pianist) and Kate Wakeling (Narrator). TROUPE invites sound-makers everywhere to join them for a noisy afternoon at Sonic HQ. HQ does its best to keep the world ticking tidily along but when a Bad Mood arrives on the grid, HQ’s sound-makers realise they haven’t a clue how to reach it. Join TROUPE in an interactive family adventure featuring movement, story-telling and music by Bach, Cage and Ravel. Weaving together brand new poetry and music from across the centuries, they present an eclectic performance of humour, colour and invention. The launch party to celebrate the publication of The Emma Press' anthology of children's poems themed around space and aliens (which includes a pacy poem about a comet by me). With readings from John Canfield, Mary Anne Clark, Dom Conlon, Julie Douglas, Sarah Doyle, Cheryl Moskovitz, Dale Neal, Phil Monks, Rachael Nicholas, Richard O'Brien, Rachel Piercey, Gita Ralleigh, Lawrence Schimel, Mike Sims, Camellia Stafford, Kate Wakeling, Rob Walton and Kate Wise. Join Aurora Orchestra and Pepper the mischievous monkey on a dare-devil musical journey to join the extraordinary Rainbow Circus. Enter the Green Leaf Forest and meet troublesome froglets, a growling lion cub and an especially slippery snake in need of some concerted charming. Blending brand-new chamber arrangements of Schumann’s enchanting music from Albumblätter, Carnival, and Album for the Young, with a specially-commissioned story from me and a host of playful opportunities to take part in the music. 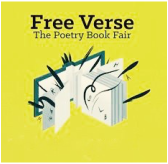 Abigail Parry, Jon Stone, Richard O'Brien and I will be reading poems about marvellous machines and alien encounters, roaming freely across time and space, with a splash of Shakespeare thrown in. We'll also be asking the audience for their help in writing a group poem together. Suitable for ages 6+. Celebrating the launch of Moon Juice, a collection of poems aimed at children aged 8+ and illustrated by award-winning artist Elīna Brasliņa. There will be balloons, puzzles, things to draw on and a special Moon Juice cake created by the wonderful Maid of Gingerbread. 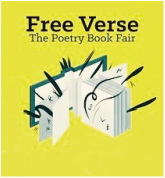 I'll be reading a short set of poems at 2.30pm and books will be on sale. All ages are welcome! Alongside Lawrence Schimel, I'll be reading poems from The Emma Press' new children's anthology Watcher of the Skies: Poems about Space and Aliens outside at the Garden Cafe. The Rialto Pamphlet Poets. Richard Scott reads from Wound, I read from The Rainbow Faults and Laura Scott reads from What I Saw.